Hiring an Inflatable Hot Tub Spa - Why not just Buy one? Inflatable hot tubs are perfect for the summer, great for relaxing in after a long days hard work, or perhaps a few evening beers and a glass of wine with friends in the spa. There are places and sites where you can hire an inflatable hot tub for a number of days, you may want one for a party, BBQ with friends, something to relax in while watching a sporting event on TV, and why not!? They are perfect for this. However, why hire when you can buy one for just..
As mentioned before there are website that allow you to hire an inflatable hot tub for 5 days for instance, the cost for this can range from £165 – £200 depending on the model and size you wish to hire. The cost is the bigger when it comes to hiring, and reason I say this is even at the cheapest rate of £165 for 5 days, you could actually purchase a similar, if not the same hot tub from £350. Inflatable hot tubs are well priced and becoming increasingly popular, which has increased in the number of different spas on the market and also helped lower prices for them. You may only want to have your hot tub for a few days hence the reason you are looking to hire, however you may love you hot tub and never want to send it back! The great thing about the inflatable hot tubs is that they are easy to move if you wish, deflate and pack away if needed, they are flexible in that you don’t purchase it, set it up and that is it, it is not a permanent fixture like traditional jacuzzi’s, so even if you purchased one for say £350, used it for a month and that was it, you could pack it away and bring it out next summer. This works out a lot better value than hiring. Which inflatable hot tub should you get? 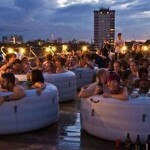 Check out this article for out top hot tubs and reviews. Check out these inflatable hot tubs, they are great value and worth considering. As they are inflatable they are ideal for rented houses, or if you think you will be moving house soon as you can easily deflate and take with you. Inflatable hot tubs are great for parties, entertaining with friends and having a BBQ. 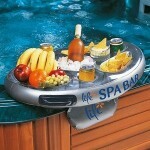 In the summer a hot tub is a great way to get your friends round, have some music playing and chilling in the spa.